I'm back today to announce our June Challenge winner! We enjoyed looking at all the fabulous entries and I hope you all had a blast getting crafty & crazy! Back to choosing our winner for our OCS challenge. Random.org chose #69 so Nancy D, you are our lucky winner! 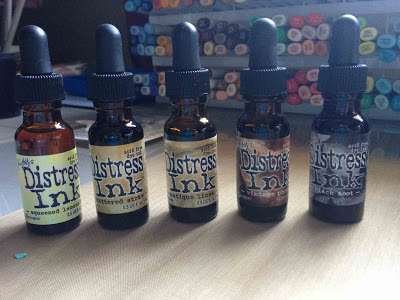 Please email lora at onecrazystamper dot com to claim your Stampaive prize pack! Check back tomorrow for a new challenge and a new chance to win!! For my post today I've used Sketchie from Saturated Canary, but I've slightly altered the image by cutting off a portion of her hair to leave her with just a bun. The wings and shoes are glittered with glitter ritz and her clothing was jazzed up with a glitter pen. 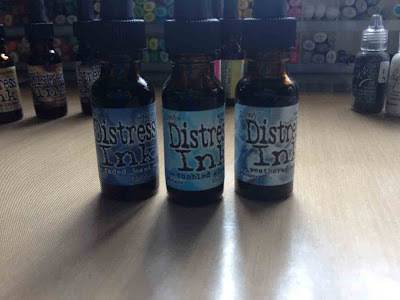 For the clouds I used a Whimsy die then distressed the edges of them with some white ink. Be sure to check back in a few days for our new challenge, but for now there is still a bit of time to enter our "Summer" challenge. Just Motoring By with a Birthday Hi! Well that is all for today, hope that you enjoyed today's card! Labels: Bazzill Card stock, Copic markers, Copic Xpress It paper, High Hopes Rubber Stamps, Memento Inks, Shari G.
Distress Inks used r these babies..
this is the stamp as well as a couple of other goodies..
Well I hope you like the card and HAPPY CANADA DAY to all of you wonderful people..Thanks for taking the time to stop by..
Good Wednesday morning to you all. It is my turn to once again post here. The weeks seem to fly by. Is it warm where you are? We are experiencing a bit of a heat wave and my hubby and I are on vacation at the moment so lots of time spent in the apartment pool is the cure for that. I have a bright and colourful card to share today that I made using an image once again this week from Saturated Canary. I enjoy colouring up these images. Remember there is still time to enter our "Summer Fun" challenge before time runs out at the end of June and a new one begins. Have a GREAT day. I hope you enjoy it no matter where you are or what you are doing. I have always adored the images that Sylvia Zet draws, and now her gorgeous images are available as rubber stamps through Whimsy Stamps as Wee Stamps. Her latest release did not disappoint - this lovely "Rosetta" is a delight to color!!! I stamped the image with Memento Tuxedo Black ink on Copic Xpress It cardstock, and then used light pastel colors to match the gorgeous designer paper from Authentique's Cherish collection. 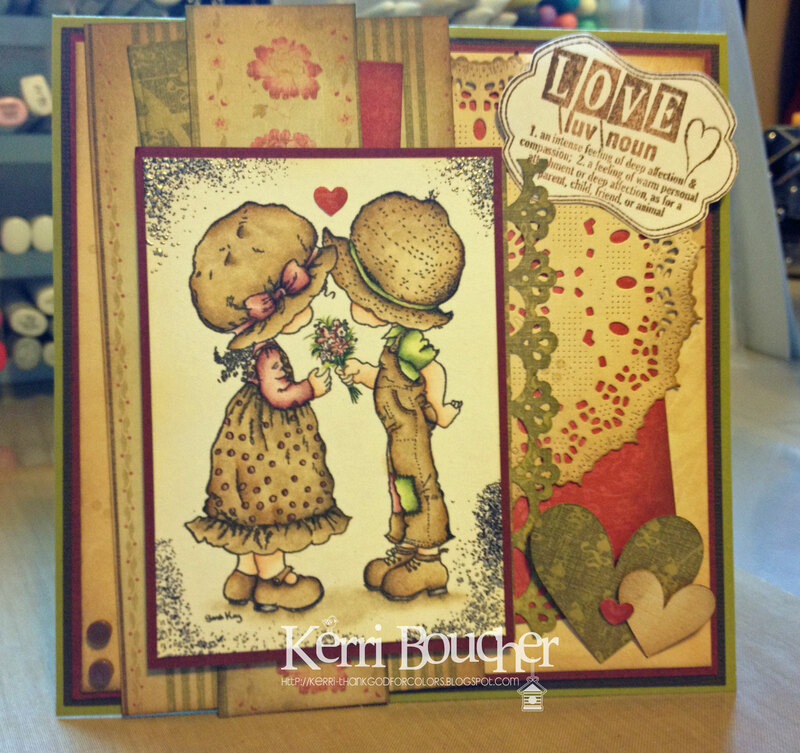 The image was cut with one of the newest Spellbinders dies - the Decorative Labels Twenty-Two. The edges of all of the designer papers are distressed, and small pearls adorn the corner of the card, which were made with a Lilac Pearl Pen. The antique lace is from my stash. 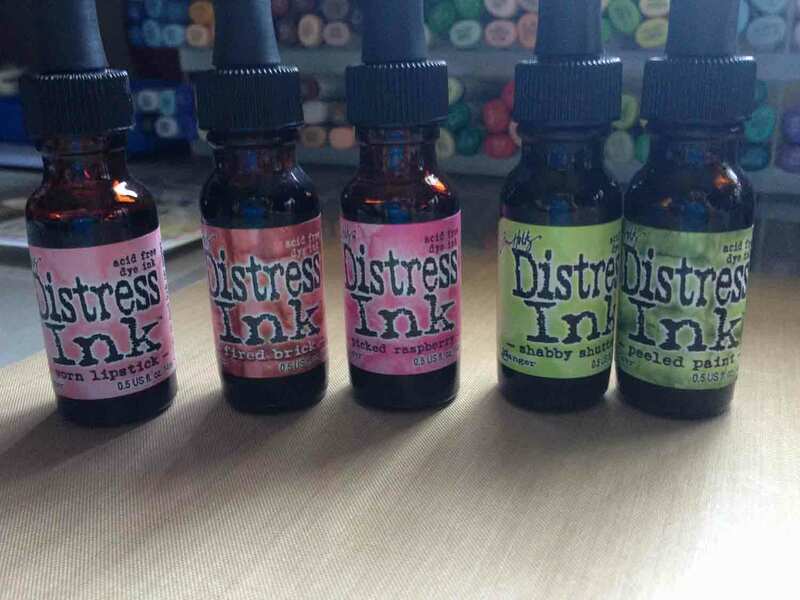 You still have a couple of days left to enter the challenge here at One Crazy Stamper to win an awesome stamp prize package - the challenge theme this month is Summer Fun!! 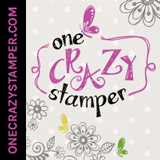 guess it goes with the challenge here at One Crazy Stamper. There is still time to play along with the challenge, so please get your Summer Fun on. 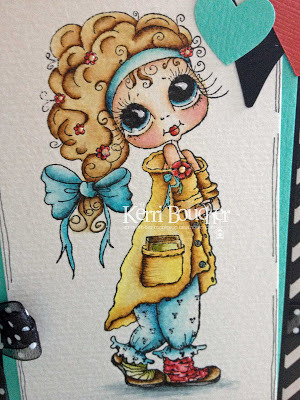 This image was great to color and I love this paper pack from Bo Bunny-Prairie Chic, lots of bright summer colors. Anyway, thats all from me. Please pop on over to One Crazy Stamper and indulge in some retail therapy. Till next time, happy crafting! Memory Box Die, Spellbinders, Ribbon, Pattern Paper-BoBunny-Prairie Chic, Twine, Glue Dots. Copics-Hair-E42, E44, E49. Dress-YG01, YG03. Hat-RV21, RV23, RV25. Flowers-FYG1, FYR1, FYG2. Eyes-B06, E43. Skin-E00, R21, E11. Shoes-C7, C9. 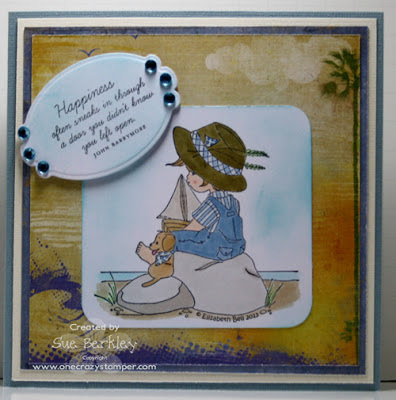 For today's post for One Crazy Stamper; I have used this adorable stamp called Little Jack and Bobbin Seaside Dreamin', which is from the Little Cottage Cuties Collection designed by Elisabeth Bell for Whimsy Stamps. 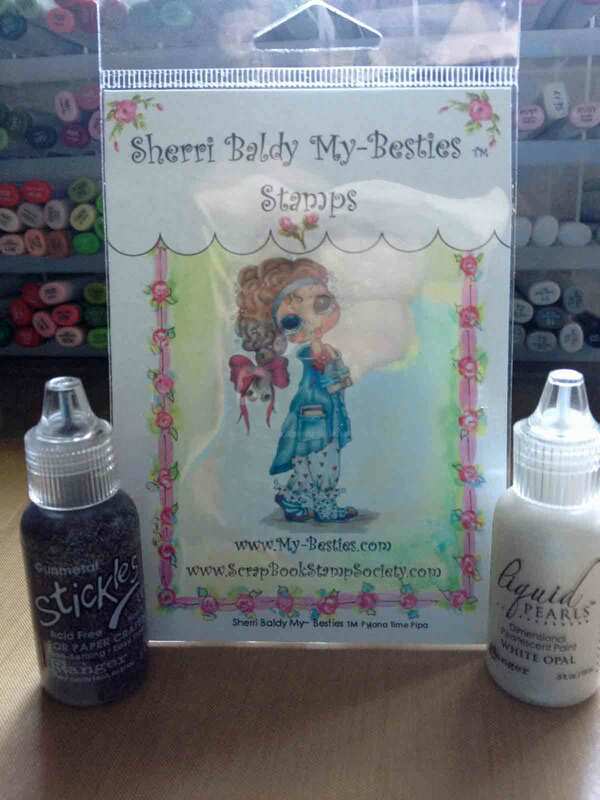 There are still a few days left to enter this month's Summer Fun challenge for a chance to win a prize pack of 2 Stampavie stamps from One Crazy Stamper. Until next time, keep crafting and having fun. Isn't this image just as cute as can be? I think so and had so much fun colouring her. As you can see I used a lot of neutral tones to allow the pink tutu to really pop on this card. I dug around in my stash for some neutral tone embellishments and found a feather, doilie, twine and a wooden clothes pin. I also used a few dies and some washi tape, I hope you like it! Hello and happy Friday! 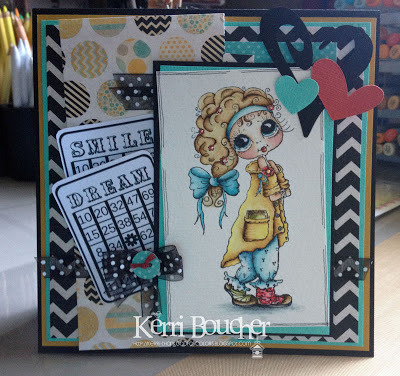 Today is a special post for me as I am going to share with you a tutorial on how to create a "Carousel" Card. What I love most about this type of card is that it is a gift all on it's own for whom ever you create it for, I guess you could say it is a mini book card. When I was creating this card I used my favorite colour, adorable images and sweet sentiments. I am going to forewarn you that this post is going to be VERY picture heavy. I am not a videographer so I decided to make my tutorial using photos - I sure hope you enjoy it and I would LOVE to hear your thoughts after you have had a chance to check it out! This great Craftable Carousel die will give you the opportunity to make unbelievable cards. You can make a full circle (which is what I have to show to you today using the largest of the dies), half a circle, or just a quarter. The possibilities are endless! * You will need to choose your paper(s) and cut 10 @ 5-3/8 x 4-3/8. I chose 5 different co-ordinating papers and cut 2 of each. *Using your ScorPal, score where I have noted on the bottom right die cut in the picture above. * Next I put my card 2 large pieces of the cardbase together on top of each other and the smaller piece in the center of the "book", then I placed all my patterened papers on the the card bases in the order that I wanted them to be seen on the carousel. Be sure to attach a piece of ribbon on the underside ofthe front andback pieces of paper so as to create the tie to close the card. *Once you have on your papers, add your "flower"anchors where two pages of the book join to keep each page attached to each other (this step can been seen on each page showing an image below). *Next you will want to add your sentiments and coloured images to all the remaining pages. Dont forget to add a "Handmade by" on the back cover! *Once you have all your indsides completed, add adhesive to the small scored tabs of the carousel die pieces and attach to each section of the insideofthe book. Below I have pictures to show you of each completed step of my book! Copic colours used on all images will be listed at the end of this post for your refference if interested. This is my card the image is a Sarah Kay the stamp is called Laura and Henri..I stamped it on white cardstock using MEMENTO TUXEDO BLACK INK..I coloured this lovely pair with PRISMA PENCILS and GAMSOL..NO COPICS I think I must be under the weather.. Happy Birthday and many SMORE! Card but Very Not Happy !! Pinwheel Fun and a Winner!!! !